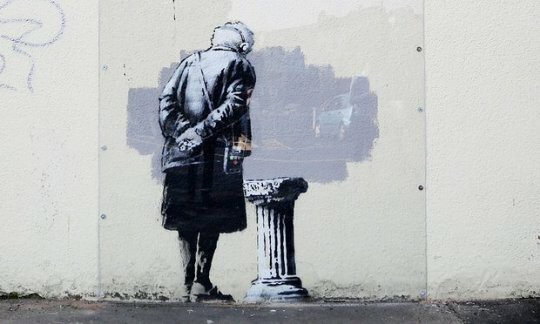 Two men were arrested in Folkestone after a copy of a Banksy artwork, which was itself the focus of a legal tussle after being ripped from a wall in the Kent town and shipped to the US, was allegedly stolen. The stencilled work by local street artist Robsci was based on Art Buff, a 2014 work by Banksy which was part of the Folkestone Triennial. Officers on patrol spotted two men apparently trying to steal the new work, which had been installed the previous day on a chipboard awning boarding up the garden of a derelict building, west of the town’s centre. Joshua Tyrell has been charged with drink driving. He was arrested in the early hours of Sunday, and has been bailed to appear in court on 21 September. A 29-year-old man from Ashford arrested on suspicion of theft was released without charge. The copy, the apparent target of the bungled raid, was photographed at the scene hours after the incident.